Steiner-based, early childhood settings abound with rich opportunities for the development of math and science concepts. This may be surprising to some who can easily see the beauty, language, and coziness of the Waldorf kindergarten, but not necessarily the mathematical or scientific side. A primary focus of Waldorf early childhood education is on the care and development of the physical body of the child, and that of the child’s environment. Considering the ‘physical’ basis of the early years, it then becomes possible to glimpse the natural mathematical relationships. In reality, all activities of Steiner-based early childhood education are math and science based, including activities of language acquisition and pre-literacy, such as listening and word recognition, patterning, and story sequencing. How do young children learn fundamental math and science concepts and skills? Concepts are the building blocks of knowledge, accumulated and built upon through experiences and physical movement in the world. Healthy children manipulate concrete materials (including their own bodies) in every situation, collecting ‘data’, and through repeated exposure, finding order for that ‘data’. The order the child then creates leads to the development of concepts. Young children are naturally astute mathematicians and scientists, learning vast amounts of information daily, as they explore the world and move in their bodies. Without needing flashcards or structured lessons however, the young child learns the fundamentals of math and science concepts, with every sense impression, movement and action. Research has shown that ‘structured’ math and science lessons in early childhood are premature and can be detrimental to proper brain development for the young child, actually interfering with concept development. The activity of play especially, provides the child with the most enriched setting for the learning of concepts. “If we observe carefully, child’s play is revealed to be excellent unconscious preparation for future education in mathematics and natural sciences, provided this play can proceed freely, and without an adult agenda.” (Developmental Signatures). [i] We can see in the young child, the brilliant genius of play in its most scientific essence. Like the archetypal ‘scientist’, the child is totally absorbed, taking great interest, exploring and ‘playing’ with the physical world. Beginning in infancy, the young child is learning concepts. The free-exploration of the early years provides the foundation for all future math and science learning. The infant begins to perceive the world and eventually to track the movements of activity in the surroundings; feeling the various textures of objects, the warmth of a caretaker’s embrace, that of the sunshine, or the cold wind blowing on the face (temperature). The child is also unconsciously living and learning at this time about the powerful rhythms of day and night, the concept of time sequence. The child learns about the physical experiences of hunger: how the body feels, what audible expressions are needed to bring a caretaker with nourishment, the comfort in the body of having physical and emotional needs met. Then, physical movement begins. One day, the child becomes aware of his limbs, and this begins the long process of discovering how to grasp objects. The child investigates every object within reach: tasting, turning over, rattling, biting, dropping objects to the ground. Concepts such as weight, texture, hardness, shape, taste, sound and temperature are all registered continually at this age through primarily, naturalistic experiences, led by the child. These spontaneously initiated experiences, are the primary mode of learning in the early years and continue to be valuable for older children, as well. An interesting and rich, natural environment, with adults engaged in purposeful activity, provide the child with endless opportunities and motivation for interacting with the surroundings. Mobile toddlers learn multiple concepts about spatial relationships with the world, in their tireless efforts to stand up, walk, and then in falling down and getting-up again. Becoming upright and mastering movement through the three planes of space is a monumental accomplishment and informs all future concepts of spatial understanding. Activities such as ‘crawling over and under’, ‘climbing’, ‘walking’, ‘running’, and ‘jumping’, naturally provide the essential bodily basis of geometry and physics. The child will now endlessly sort objects, pick them up, carry them, place them inside of a container and then dump them out again, developing the concepts of one-to-one correspondence and cause and effect. It is very interesting (and fun!) to bang on pots with wooden spoons, drop food on the floor (gravity), to build with blocks, and pick-up the tiniest objects visible on the ground. Toddlers explore the concept of weight, especially that of ‘heavy’. They also experiment with throwing objects into the air. Being in water is another ‘laboratory’, where this fluid medium allows for the experience of buoyancy. Healthy physical development of the child is a critical prerequisite for proper mathematical and scientific education. Plenty of movement and opportunities for play provide physiological, neurological, and the experiential foundations for learning about the physical world[ii]. The young child needs tremendous amounts of movement (often under-estimated today), sleep, and a healthy diet rich in essential fats, in order to support the proper myelinization of the brain, which is required for the successful development of sensory, motor, and cognitive functions, in preparation for academic readiness. “His consciousness slowly awakens to grasp the qualities of space and time, of quantity, number and geometric laws in correspondence to his physical development. That is why the healthy formation and maturation of the sensory organs and their functions, as well as the movement organism, are a top priority of preschool and kindergarten education, extending into the first few grades of elementary school. Through their activities the children come to know the properties, qualities and patterns of their environment. For example, coming to stand upright and learning to walk are experiences of gravity and spatial dimensions. Later, similarly, the child bodily experiences momentum and buoyancy, gravity, centrifugal force, friction, and so forth, when he jumps rope, plays on the swings, merry-go-round, teeter-totter or slides. He can comprehend these principles and transpose them into his play, when, for example, he lets chestnuts roll down the slope of a wooden board or when he builds runways for marbles or bridges and towers. In this process he also explores the laws of leverage, stasis and balance.”[iii] (Developmental Signatures). All young children delight in participating in concrete, everyday activities, all of which support math and science concept development. Those of the home or kindergarten environment are especially accessible at this age: taking the compost out to the garden, digging and preparing the garden, watching the plants grow, caring for pets, sweeping the floor, setting the table, chopping vegetables, serving food, dusting the furniture, woodworking, picking up toys and putting them away (ordering), sorting the onions from the potatoes (sets and classifying), sorting laundry, ordering the boots by the front door, baking. Singing together and playing live (unrecorded) music, allows for proper development of the inner ear, forming musical and acoustical foundations for math and science. Movement in play and circle/ring time provides many opportunities for learning body geography, developing balance, spatial awareness and orientation; vestibular, proprioceptive, and kinesthetic integration, all of which provide critical foundations for mathematics. Playing with logs, stumps, boards, bricks, ropes etc., allows for mechanical learning that can include levers, fulcrums, and pulleys. Dramatic play includes dressing-up, ‘house’ building and the imaginative (representational) use of objects. For example, a piece of wood may be used as an iron or telephone, or a puppet used as a character to tell a story, which provides the neurological foundations for the later use of abstract symbols (numbers and letters) to represent ideas. Cooking allows for learning the concepts of measurement, parts and wholes, chemistry, volume. Preschool and kindergarten-aged children learn about the concept of counting by counting napkins, birthday candles, how many chairs are needed at the table? They enjoy rhythmic, repetitive language in storytelling, and counting, clapping, songs and verses, which support mathematical foundations. They love to sort toys, shapes, colors, animals, etc., which develop the concept of classifying, a pre-algebraic skill. Order, patterns and sequence become very important at this age as the young child begins to organize these concepts and have beginning capacities for abstract thought. The earlier acquired concept of one-to-one correspondence in infancy and toddlerhood is foundational for the concepts of this stage. Examples of this concept for the young child include: one mitten for each hand, one shoe for each foot, one hat for each head, one coat hook for each coat, one seed for each hole in the planting row, one chair/cup/bowl for each person, etc. According to the National Council of Teachers of Mathematics (NCTM)[iv], one-to-one correspondence is a focal point for number and operations at the pre-kindergarten level. The development of math & science “concepts and skills” from birth to age 7, follow a developmental sequence. [v] Several standard concepts are listed below, with examples of activities that may occur in a Steiner early-childhood setting or at home. In addition, young children naturally acquire standard, science process skills, such as questioning, analyzing, reasoning, communicating, connecting, representing, investigating and organizing through plentiful daily opportunities for cooperative and/or solo free-play, and practical activities. One-to-one correspondence – “One for you and one for me”, putting on shoes/hat etc., lids on pots, one little bear in each boat, sitting on a chair., planting one seed in each hole, one ticket for each train passenger, taking turns – ‘one at a time’. Each puppet represents one character in the puppet play. Playing catch with a ball or beanbag. Serving food to others. Taking turns. Number – Three apples, two shoes, one kitty, one kiss, one baby, four children, one cake, three candles, etc. Sets and classifying (pre-algebra)- Sorting: laundry, buttons, seeds, carrots from potatoes, spoons and forks, toy cars from trucks, wooden animals. Grouping objects by color, use, etc. Collecting autumn leaves, stones, seashells, etc. Comparing – Bigger/taller than, smaller/shorter than, “The Three Billy Goats Gruff”, “The Three Bears”. Heavy or light, color differences, taste, smell. Hot and cold. Speech variation in storytelling, nursery rhymes. Does an object sink or float? Light and shadow. Loud and quiet, hard and soft, giant steps and tiptoe steps, yelling and whispering. ‘Breathing’ in and ‘breathing’ out. Contrast of rest and movement, becomes a foundation for music. Counting – How many carrots do we need so that each rabbit will get one? How many crackers are on the plate? “The Three Little Pigs”. Songs such as: “Five Little Ducks”, “This Old Man”, “Baa Baa Black Sheep”. Verses such as: “1,2,3,4,5 Once I Caught a Fish Alive”, “I Have Ten Little Fingers”, “One, Two, Buckle My Shoe”. Parts and Wholes (Preparation for fractions in grade school)– Slicing a loaf of bread, cutting apples in half (to see the ‘star’), chopping vegetables for soup. Play the game “The Farmer In The Dell” – where part of the group goes into the center and part stays in the outside circle. Peeling potatoes. Acting out stories. Cooking. Grinding wheat, rolling oats. Pizza slices. Language – Communication during work or play, describing ideas or observations. Naming activities. Cooperative-play discussions among children. Story-telling, verses, nursery rhymes. Ordering, seriation, patterning (logic, pre-algebra) – Daily, weekly, yearly rhythms; predictable daily events. Seasonal festivals. Circle games. Story-telling, poetry, verses – rhythm of language. Rhythmic clapping. Putting toys away into their places after playtime. In play: lining up cars, blocks or train cars in order of size, color. Stacking toys. Experimenting freely with materials to create a pattern, such as tissue-paper ‘stained glass windows’ or stringing beads. Informal measurement: weight, length, temperature, volume, time, sequence – Measuring ingredients for cooking and baking, pouring tea, filling the bird feeder, growth charts (how tall am I?). Is it cold outside or hot? Ironing. Digging in sand and filling buckets, pouring water at a water table or bathtub (filling and dumping). Playing on a teeter-totter or using a balance scale – who/what is heavier? Planting seeds and watching seedlings grow. Sequential stories and nursery rhymes: “The Gingerbread Boy”, “Hickory Dickory Dock”, “Little Louse and Little Flea”, “Henny Penny”, “Jack and Jill”, “Little Jack Horner”, “Brown Bear, Brown Bear”. Dipping candles. Graphing (representational)– Daily chores list, growth charts, Advent calendar, birthday calendar. Pictorial ‘graphs’ that show information, such as drawing pictures of what came to the bird feeder today. Number symbols *(higher level ) – Using numerals (symbols) to represent the amount of a group of things. “I am six years old.” My phone number is ______”. Recognizing number symbols. Groups and symbols *(higher level) – Matching a symbol to a group or a group to a symbol. Child takes play money, or a group of objects to represent ‘money’ and goes to the play store to ‘buy’ things, based on the ‘price’. Shopping at a children’s holiday market, such as the ‘Winter Faire’, in many Waldorf schools. 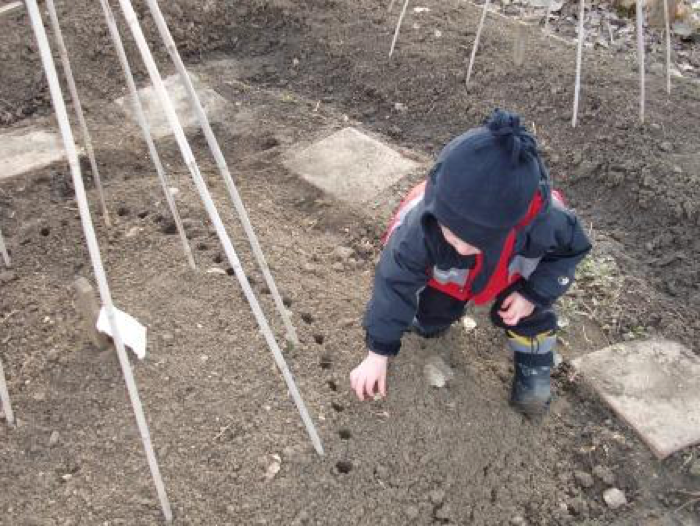 In the sandbox, a child makes a ‘birthday cake’, puts 6 candles on it, and may write the number ‘6’ or have an adult write it. Concrete (real objects) addition and subtraction *(higher level) – A child has two seashells and finds two more seashells – 2 and 2 make 4. Giving away two seashells to a friend leaves 2. ‘Bartering’ play. Handing out party favors to friends at a party. Collecting and using tokens in a game. Each day in the kindergarten, the wheel is ‘re-invented’, in multiple ways. All physical laws are worked with unconsciously in play, as children test and discover new ways of working with the physical world around them. It is an exciting and innovative ‘flow’ environment, where every idea is ‘possible’ and each child is an inventor. The enormous ‘research’ of early childhood in play and movement forms the essential physical basis for math and science. iRainer Patzlaff, et al., Developmental Signatures – Core Values and Practices in Waldorf Education for Children Ages 3-9 (Ghent, N.Y.: The Association of Waldorf Schools of North America, 2007) 112. [ii]BNET – CBS Business News Network, “Push, pull, toss, tilt, swing: Physics for Young Children” by Carol E. Marxen, Summer 1995, 29 May 2010 (http://findarticles.com/p/articles/mi_qa3614/is_199507/ai_n8731474/). [iv]Rosalind Charlesworth & Karen K. Lind, Math & Science For Young Children – Sixth Edition, (Belmont, CA: Wadsworth/Cengage Learning, 2010) 118. [vi] Audrey McAllen, The Extra Lesson, (Fair Oaks, CA: Rudolf Steiner College Press, 1998). [vii] Nancy Blanning and Laurie Clark, Movement Journeys and Circle Adventures – Movement Enrichment With A Therapeutic Approach For Early Childhood, “n.p.”, 29 May 2010 (available through Bob & Nancy’s Bookshop: http://www.waldorfbooks.com/edu/thr/early_childhood.htm). Blanning, Nancy and Laurie Clark. Movement Journeys and Circle Adventures – Movement Enrichment With A Therapeutic Approach For Early Childhood, (n.p.). Charlesworth, Rosalind and Karen K. Lind. Math & Science and the Young Child. (Belmont, CA. : Wadsworth/Cengage Learning, 2010). Marxen, Carol E., “Push, pull, toss, tilt, swing: Physics for Young Children”, Summer 1995, 29 May 2010, BNET – CBS Business Network (http://findarticles.com/p/articles/mi_qa3614/is_199507/ai_n8731474/). McAllen, Audrey. The Extra Lesson, (Fair Oaks, CA: Rudolf Steiner College Press, 1998). Patzlaff, Rainier, et al. Developmental Signatures – Core Values and Practices in Waldorf Education for Children Ages 3-9. (Ghent, N.Y.: The Association of Waldorf Schools of North America, 2007).